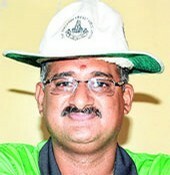 In this episode, former Tamil Nadu cricketer and current coach of R Ashwin, Sunil Subramaniam, talks about his playing career and the reasons why he never got a chance to play for India, spin bowling mechanics, what he saw in Ashwin as a youngster, the effects of T20 on bowling skills, amongst other things. You can download the episode by clicking on the link here. The podcast was first published on ESPN Cricinfo’s The Cordon. Subscribe to Couch Talk podcast on iTunes. CouchTalk is also available on TuneIn Radio and select episodes on the YouTube Channel (ccTV). This entry was posted in Couch Talk, Featured, India and tagged Coaching, Couch Talk, India, Podcast, R Ashwin, Spin bowling, Sunil Subramaniam, Tamil Nadu, TNCA. Bookmark the permalink.